Jenna Kaiser, Mary Manfredi, Anna Nuzzolese, Kyle Robinson, Eve Romanowski, Marygrace Urmson. All images courtesy Alma A. Clarke papers, 1914-1946, Special Collections Department, Bryn Mawr College Library. In Women and World War I Susan Grayzel argues persuasively that historians have not yet answered the question did “Did women have a great war” because they bifurcate the first world war “as either being ‘good’ or ‘bad’ for women” rather than portraying “the complexity and diversity of women’s experiences.” As a way of getting at those experiences, this paper explores tropes of sacrifice and sisterliness wrapped up in the ideal of service as they appear in the scrapbook of Alma Adelaide Clarke, an Auxiliary Nurse in American Red Cross Military Hospital No. 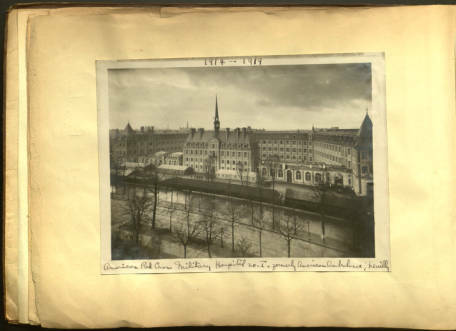 1 in Neuilly Sur-Seine from the fall of 1918 to February of 1919. Born in 1890 in Paris France to the well-known artist Thomas Shields Clarke, Alma Adelaide Clarke led a privileged life. At some point, she became involved in the Froebel League, a progressive organization that offered mother’s classes and sponsored kindergartens, but beyond that I have found little information about her life before the war. Clarke had been touring the Continent since the May of 1912. According to one account, she was in Baden Baden when the Great War broke out. Unlike her brother, an art student off sketching in Bordeaux who was held as a potential spy until the American ambassador to France intervened, Alma made her way via Geneva to Paris. Arriving the end of August of 1914, she nursed the wounded for a month in the American Ambulance Hospital until October of 1914 when she returned to the US. What she did between the fall of 1914 and the fall of 1917 is unknown, but in November the French American Committee for the Protection of Children accepted her application. She set sail for France in January of 1918 and for eight months volunteered in various colonies of refuge children. However, in the fall of 1918 she returned to the hospital she’d nursed in during 1914, now renamed the American Red Cross Military Hospital No1, where she remained until Feb of 1919 when the last patients were evacuated. 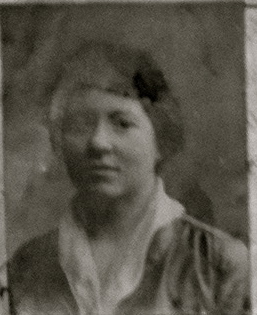 As she wrote to her brother, a private in the American Expeditionary Force, in January of 1919 “I am rather tired I confess but I do hate to go home till I have done all that I can in France.” Clarke returned to working with refuge children before sailing home to the United States at the end of July 1919. 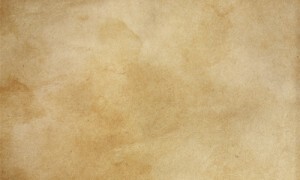 Although only a few letters from Clarke remain, she left what she described as “a most unique souvenir” a scrapbook. Clarke’s wartime experiences might have faded into obscurity, acknowledged only generally in the lines historians have penned about the thousands of female Red Cross volunteers who served Europe, had she not arranged before her death to have it, along with her wartime papers and a second album documenting her work with refuge children, placed in Bryn Mawr College Special Collections. Clarke’s scrapbooks, and the others like it that I’ve uncovered, reveal a unique source for exploring the ways individual women responded to gendered imagery of the war, particularly the propaganda aimed at them. 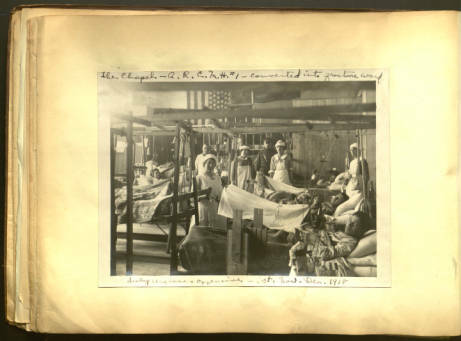 Clarke’s Red Cross album consists of photographs, both official but many taken by her, along with magazine and newspaper clippings, and eleven pages of soldiers own accounts detailing where and how they were wounded. She combined these photographs, laboriously annotated by hand, with clippings of illustrations or poems to create coherent narratives. In this sense, her scrapbook functions not only as a record, but also as a testimonial and a memento mori. The majority of the clippings derive from the Red Cross Magazine, as effective a propaganda organ as you’d find during the war. Thousands of American women went to France to serve the Red Cross but what that experience meant to them and to histories of gender is still hotly debated by historians. Jonathan Ebel outlines three “mythic notions” of womanhood at work during the Great War, “war wives and mothers” on the home front and “sisters in arms” and “new women warriors” overseas. Clarke’s album suggests a combination of these mythic meanings might best characterize her Great War. 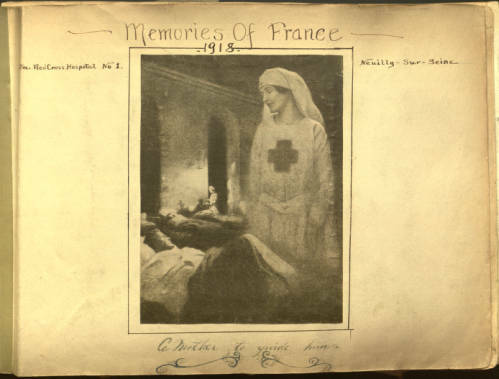 While the frontispiece of her Red Cross album is annotated “a mother to guide him,” the oversized nurse who looms over the sleeping soldier seems more guardian angel than mother tucking in her child. Paul J. Meylan, as part of a campaign to address the desperate shortage of nurses, created this “protecting angel.” The rather beatific visage of the nurse was juxtaposed against the slogan “Nurses of America: You are needed over there!” with the invocation of “over there” making an explicit connection between men’s service in the service and women offering service to the armed services. An article, Sister to a Million Men, that Clarke pasted into her scrapbook in its four page entirety, offers perhaps the greatest insights into how she understood her contribution to the war. You used to see scores of girls like her on country club porches when the late brilliant sun was slanting in your face as you walked up from the eighteenth green … You thought she didn t have a thought in her head But she had a very definite thought and it’s taken her to France To day you see her against a very different back ground You see her walking very lightly around a hospital ward She has a blue veil on her head now instead of a floppy hat She has a pile of bandages or clean sheets in her hands instead of the parasol Perhaps she went to France with false notions of sentimentality or with an absurd impulsive offer of service which seemed very immature and impractical … but watch her now in the where she rules over a score and a half of wounded men in her own right. The Sister here of course refers not only to the Anglophone practice of referring to nurses as Sisters, a practice not adopted by American Red Cross workers, but also to the easy familiarity with which the socialite turned nurse jokes with the men on her ward. “[T]his girl who wouldn’t have washed her own hair before the war” now blithely inquires “feel well enough for that long-promised bath?” and without flinching distracts a young soldier from the pain of having his wounds re-dressed. When at the end of the day, this dedicated volunteer is asked, “Say, sister, was you ever on a farm” and she responds in the affirmative, accidentally betraying herself as “unmarried” yet owning a large farm “all by herself,” the men are momentarily stunned into silence realizing that their handmaiden is an heiress. Little matter though to the selfless auxiliary who continues her rounds. McClurg’s remarks highlight the complex class dynamics that existed between trained nurses, largely middle class women, and those who populated the ‘auxiliaries” from “a more elite socioeconomic background.” If the famed American Friends Ambulance corp drivers attached to the hospital where Clark nursed were known as the Gentlemen Volunteers, then the female volunteers were just as much the heiress corp from the Vanderbilt who endowed the hospital through the society ladies who sponsored individual beds or even entire wards and finally to the women who volunteered there, first expatriate Americans, and then women like Clarke who traveled explicitly to serve, at her own expense, first class of course. The class based distinctions between the lofty service of auxiliary workers and trained nurses who worked for pay with all the pecuniary imprecations the word work could carry appears repeatedly in documents sent to Clarke by various organizations, all of which lauded her service. It is only the French, perhaps less conversant with the American war rhetoric, that invoked work in her correspondence. Clarke seems to have understood her service as a combination of sacrifice and sisterliness. Janet Watson has argued that “women’s war work” existed in tension with notions of “service” implicit in the voluntary nature of most women’s participation “a double meaning of service – both philanthropically to those in need and patriotically to the country in its crisis.” This dual notion is perhaps best seen in a page Clarke created with an image drawn by Charles Dana Gibson for the Red Cross. In Columbia’s Greater Task Columbia as a Red Cross nurse supports a wounded soldier as she escorts him from the battlefield. The image was annotated by a short verse that drew together religious sacrifice and patriotic service. The Cross a small neat stain where blood has been. The Cross that whispers hope to fighting men. in colors of the heart within a firm embrace. Alongside Columbia aiding the fallen man, Clarke pasted four photographs of the men she nursed, including a group shot of her first ward. On the adjoining page the men in the images have explained where they were wounded, mostly in the battle of the Argonne. A French Soldier includes a not of thanks to Clarke for the care she gave him. On this page is also a photograph of one of the men Clarke cared for the longest. Frank R. Neidert, son of a meat cutter from a small town near Rochester NY, was just 17 when he was wounded in September of 1918. Severely hurt, he remained at the hospital until it closed, not returning to the US until late February 1919 where he was discharged with a 75% disability. It is clear Clarke felt particularly protective of him as she noted his age in another photograph of her sitting alongside his bed. Just as soldiers would sacrifice their lives for comrades in arms, nurses stood ready to do the same for those in their charge. Next to an article praising the bravery of the American soldiers, Clarke has placed a protecting angel image Won’t you help yet another poster created for the Red Cross. In this example, the nurse fends off the angel of death while using her body to shield a fallen soldier. The protecting angel as the female equivalent to the Christ like soldier is evident as well in a page that functions as a memento mori. 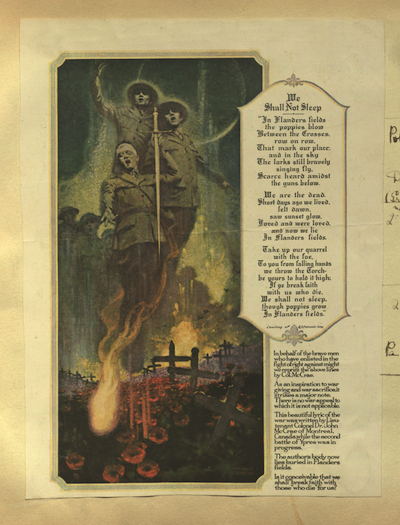 Next to the poem We Shall Not Sleep, illustrated by a lithograph of painting by Philip Lyford that depicts the fallen soldier as a resurrected Christ, Clarke wrote the names of four deceased men, at least one of whom died in her hospital. She details their burials and notes the location of the gravesites for two of them. Alongside are a photograph of a cross marking a grave that echoes the cross imagery in Lyford’s image, and a clipping of Taps. The effect is chilling even decades later and it is clear that Clarke felt loss ever bit as much as McCree. The direction of Clarke’s life in the decades after the armistice reveals complexities that any bifurcated analysis of the Great War cannot contain. To to say that Clarke’s life was not transformed by her participation would be absurd. 1923 found Clarke back in France, with the Ladies Auxiliary of the American Legion, working in their school for children of American servicemen who married French women and serving as chairman of the Volunteer Interpreter’s Service during Legion Convention week held to mark the 5th anniversary of the armistice. By 1928 Clarke had become “indispensible in the success of the Paris Posts’ poppy sale.” In the 1930s Clarke, now president of the Paris Post, became a vocal advocate for French wives and children of demobilized soldiers who had abandoned by them. She herself adopted three girls, remaining in France until the mid 1930s, when the winds of war again swept through the continent. These activities with their strong maternalist overtones are difficult to place on a conservative to liberation spectrum and there are many more “hidden collections” of women like Clarke that provide an intimate glimpse into these women’s Great War. While I initially thought her scrapbook to be a unique archival find, I’ve come to discover, through the internet, at least three more that are quite similar, including the soldiers accounts. 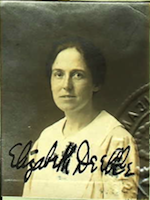 I just recently found, by tracing the life of one of the soldiers in her album, that letters to a sister auxiliary nurse, Elizabeth Deeble are archived, which may offer insights into not only another woman’s Great War, but how the service of overseas volunteers was understood by friends and family. 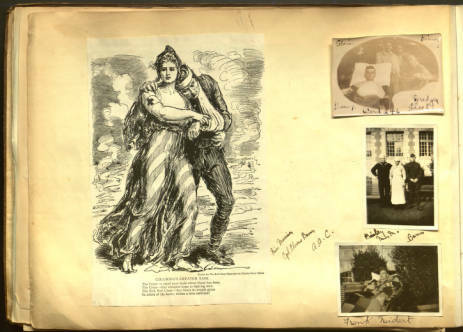 Because of the open and ongoing nature of this research, my history of Alma Clark’s scrapbooks is taking a digital format in which we invite others to remix the scrapbook pages, annotating their finds, and creating multiple narratives of gender in the great war. While the poem, penned and illustrated by Sergeant William E. Shiflet, of Co. C. 18th Regiment of the 1st Infantry Brigade,. appears to be original, he drew on well-established imagery of the Great War. 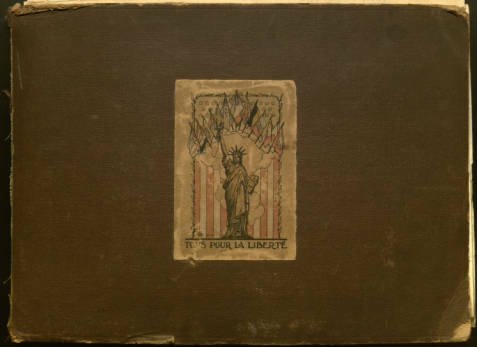 While the poem, penned and illustrated by Sergeant William E. Shiflet, of company C, 18th Regiment, 1st Infantry, appears to be original, he drew on well-established imagery of the Great War. The phrase ‘flower of manhood’ is scattered throughout print culture of the nineteenth-century, but it became particularly associated with the fallen men of the Great War when the poppy was adopted an emblem of remembrance, due to the popularity of McCree’s poem which Alma A. Clarke pasted into her album. 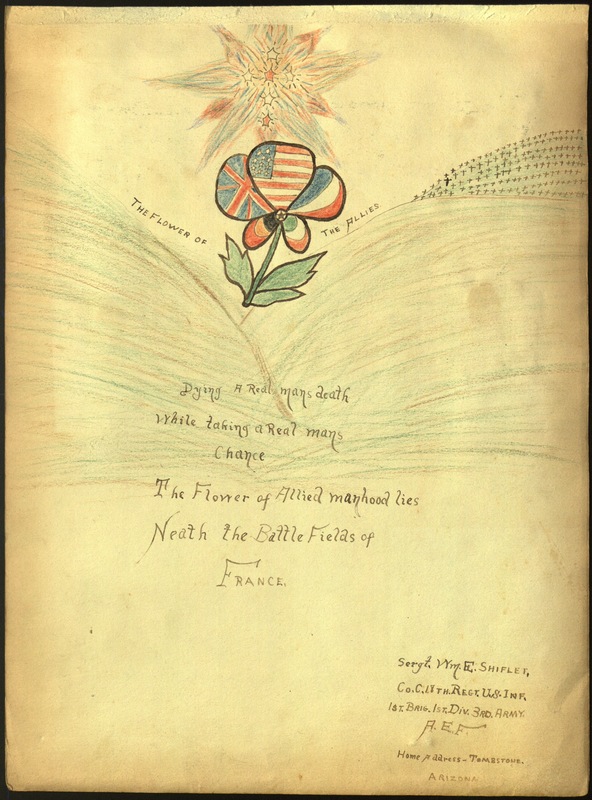 In Shiflet’s illustration, however, the poppy becomes not only a memento mori, but also a celebration of the entente between Britain, France, and the United States, as the petals feature the iconography of each nation’s flag. Shiflet's title “the Flower of the Allies” seems to be more original, although the exact phrase "moving the Flower of the allies into the Aisne sector" in a May 29, 1918 newspaper account reflects the circulation of the “flower” trope in all forms of wartime writing. 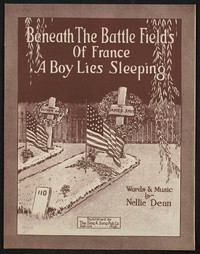 Canadian Poet Edythe Morahan de Lauzon offered a more pacifist interpretation, “NEATH the battlefields of France, Sleep a mighty throng; And o'er their resting place the birds Carol many a song,” while a popular song lamented “beneath the battle fields of France a boy lies sleeping." One page of Alma Clarke's scrapbook seems to function as her own memorial for the fallen soldier who lay buried in France. 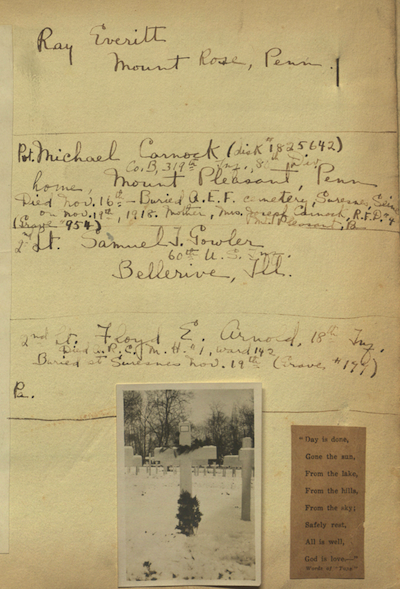 Alongside the image of In Flanders Fields, Clarke annotated the names and locations of three Pennsylvania soldiers' graves and pasted an photograph of a grave site and a clipping of Taps. Shiflet was not so lucky in his next encounter with “Fritz.” Prior to the battle of Cantigny, on May 4, he was gassed for five and a half hours. Blinded for over two weeks, he was hospitalized in Troazie, and released just in time to fight at Soissons on July 17. In November of 1918, while in American Red Cross Military Hospital no. 1, Shiflet wrote a lengthy account of his wartime experiences to his father, which was subsequently published in his hometown newspaper, The Watervliet Record. His poetic streak is still evident “Many a better man than I had ‘paid in full’ I had no right to expect less." Although Shiflet longed to return home, “I would give a lot to be back with my little woman and enjoy life. I have seen enough of death in its worst form” while convalescing, he assisted his physician, Dr. Crossan, with dressing the wounded “out of my line of duty … but it’s all for Uncle Sam.” Dr. Crossan appears in a photograph of the medical staff Clarke included in her album, although if she was friendly with any particularly physician she left no record of that. 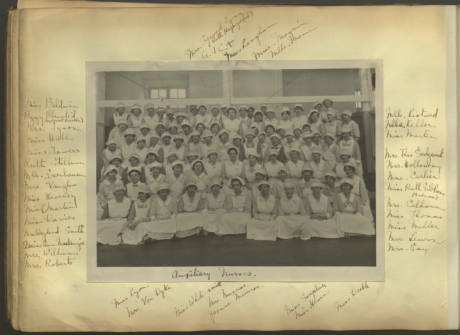 Shiflet appears no where else in Clarke's albums, but his favorite nurse, Elizabeth Deeble, is included in a photograph of the auxiliary nurses in the scrapbook, her presence annotated by Clarke who at least knew her by name. William E. Shiflet returned home and married Myrtle. He died in May 1950, having lived long enough to register for, but not serve in, the second world war. Like Clarke, Elizabeth Deeble’s life seems to have been radically altered by her wartime experiences. She and her aviator fiancé had postponed their marriage in order to serve in France (the Red Cross would not accept female relatives of servicemen until very late in the war) Deeble never married. Perhaps her fiancé was killed in action. She kept in touch with William Shiflet, at least for a few years after the war. The Watervliet Record of November 17, 1922 reports that "William Shiflet .. was remember by his former nurse Elizabeth Deeble ... who sent him several pairs of knit socks, a sweeter, and a muffler." According to her alma mater, Andover Academy, she became a war correspondent during the Spanish Civil War. Letters she received while serving in France are held at the Chevy Chase Historical Society . Some of her papers seem to be in the Historical Society of Washington, D.C.
Cover and page 1 AlmaClarke_BMC_001r English WWI Scrapbook, Alma A. Clarke Papers, 1914-1946, Special Collections Department, Bryn Mawr College Library. Page 2 detail of AlmaClarke_BMC_050r English WWI Scrapbook, Alma A. Clarke Papers, 1914-1946, Special Collections Department, Bryn Mawr College Library. Page 4 detail of AlmaClarke_BMC_050r English WWI Scrapbook, Alma A. Clarke Papers, 1914-1946, Special Collections Department, Bryn Mawr College Library. Page 5 all quotes from Shiflet are taken from Letter to Frank E. Shiflet, November 24, 1918, The Watervliet Record January 17,1919, np. Page 6 AlmaClarke_BMC_026v English WWI Scrapbook, Alma A. Clarke Papers, 1914-1946, Special Collections Department, Bryn Mawr College Library. Page 7 AlmaClarke_BMC_039vr English WWI Scrapbook, Alma A. Clarke Papers, 1914-1946, Special Collections Department, Bryn Mawr College Library. The American Expeditionary Force entered the Great War on April 6, 1917. The men who created this fighting force came from all across the American continent. Each had their own story that became intersected thanks to one nurse’s scrapbook. The following pages showcase just a small sample of some of the men who are featured in Alma A. Clarke’s scrapbook. The experience of these men had forever changed them due to their injuries and participation in the Great War. The following pages give readers a small glimpse into the lives of Loyd E. Ireland, Frank E Leman, and Cornelius O’ Rourke. 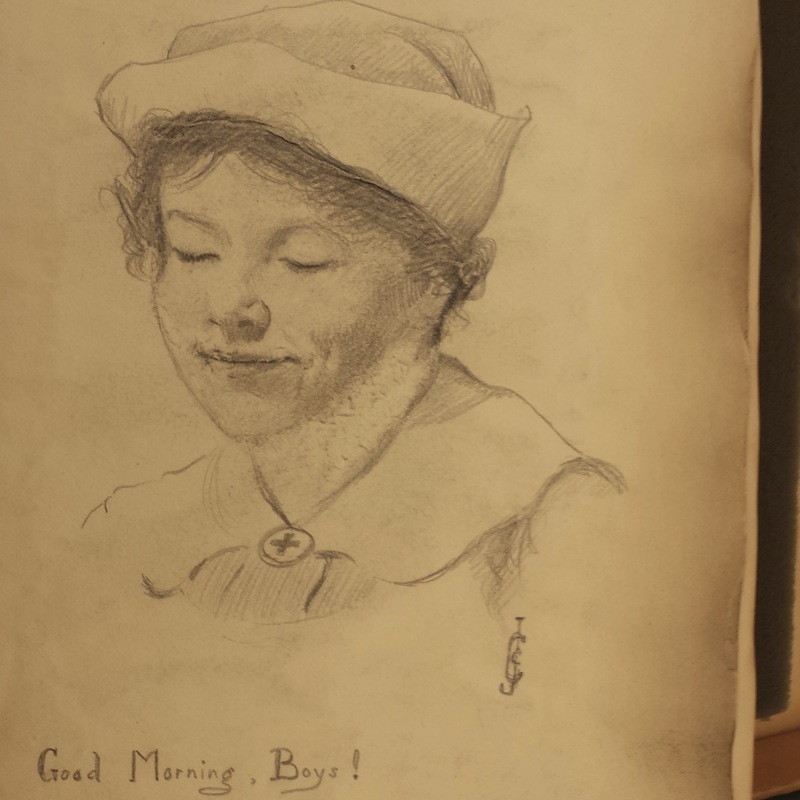 By including their artwork and poems, these three men showcased how war became personal. Their personal touch shows that each soldier is not a statistic, but a real person with their own story and history. Loyd E. Ireland was born on December 20, 1892 in Brainerd, Minnesota (Draft Card). He was an accomplished wrestler before the war, winning and defending the world bantamweight title. From this career, he picked up the nickname “Kid Irish” (Tacoma Times). Ireland enlisted in 1917 and train soldiers at Camp Lewis in jiu-jitsu (Harrisburg). During the Meuse-Argonne offensive, Ireland’s right foot was crushed, requiring him to be treated at American Red Cross Hospital No. 1 where he drew this picture in Clarke’s scrapbook. After the war, Ireland became the head of the Disabled American Veterans for Washington State (Tacoma Public). He also continued his wrestling career and produced a book entitled “A Private in Battery A,” a compilation of his drawings and poems written during the war. In November 1963, Ireland passed away at his home in Tacoma, Washington. 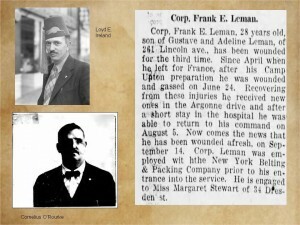 Frank E. Leman was born on April 6, 1890 in Brooklyn, New York (WWI). Before the war, Leman was an average citizen. He worked for the New York Belting and Packing Company. He also participated in the Emerald Pleasure Club, a group of entertainers and musicians (Brooklyn). He enlisted in 1917. During the course of the war, Leman was injured three times. He was promoted to the rank of corporal. Eventually, Leman had to have his left leg amputated where he eventually got a wooden peg leg. After the war, Leman returned to Brooklyn where he worked for the US Rubber Company (WWII). He passed away on January 11, 1966 and was buried at Long Island National Cemetery. Cornelius O’Rourke was born on April 30, 1886 in Killarney, Ireland (Passport). In April 1908, O’Rourke immigrated to the United States where he went to live in Glens Falls, New York. On March 30, 1916 in the town of New Haven, Connecticut, O’Rourke became a naturalized citizen of the United States. O’Rourke served in France from April 1918 to March 1919. He earned the rank of first sergeant and won the Distinguished Service Cross. However, he was seriously wounded in combat while rescuing two fellow servicemen. He lived with these scars for the rest of his life. At this time, not much can be found or is known about O’Rourke after the war. In 1924, he applied for a US passport in order to return to Ireland to visit his parents. After three months in Ireland, he returned to Glens Falls but most likely remained incapacitated. It is unknown when and where he died. Cover image- “Gun crew from Regimental Headquarters Company, 23rd Infantry, firing 37mm gun during an advance against German entrenched positions.,1918” Department of Defense. National Archives. Page 2 images- “Loyd E. Ireland.” Tacoma Times (15 August 1936, pg. 10). Tacoma Public Library. “Cornelius O’Rourke,” US Passport Application, National Archives. Page 4- “Loyd E. Ireland” US World War I Draft Registration Card 1917-1918, National Archives. “World Title at Stake in Camp Smoker,” Tacoma Times (27 November 1917, pg. 6). Library of Congress. “Athletics are Booming at Camp Lewis, Wash.” The Evening News (24 December 1917, pg. 5). Newspapers.com. Page 6- “Frank E Leman” US World War I Draft Registration Card 1917-1918, National Archives. “Emerald Pleasure Club,” The Brooklyn Daily Eagle (11 February 1906, pg. 5). Newspapers.com. “Frank Edward Leman” US World War II Draft Registration Card 1942, National Archives. "Faces of War" Caroline Alexander. Smithsonian.com February 2007. 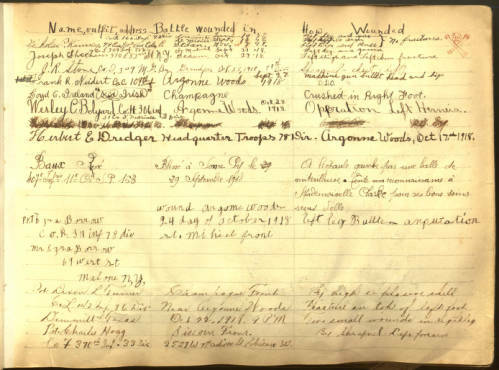 Page 8- “Cornelius O’Rourke,” US Passport Application, National Archives. Alma Adelaide Clarke had been abroad for a year when fighting in the Great War broke out. As the daughter of a well-known artist Thomas Shields Clarke, her adventures warranted recounting by society columnists in both New York City and Washington D.C. While her younger brother Jack became caught in the initial skirmishes of war, eventually requiring rescue by the American ambassador to France, Alma made her way from Baden-Baden in Germany via Geneva to Paris. Arriving at the end of August of 1914, she volunteered as a Red Cross nurse in the just-opened American Ambulance Hospital in Neuilly-Sur-Seine on the outskirts of Paris. Alma Clarke remained at the American Ambulance, as it was colloquially known, for only a month before returning to the US. Precisely what she did from the fall of 1914 to the fall of 1917 is unclear, although once the United States entered the war, she began trying to get back to France. Cover - image 1AlmaClarke_BMC_fc English WWI Scrapbook, Alma A. Clarke Papers, 1914-1946, Special Collections Department, Bryn Mawr College Library. Page 2 image AlmaClarkeFrench_BMC_0002r French WWI Scrapbook, Alma A. Clarke Papers, 1914-1946, Special Collections Department, Bryn Mawr College Library. Mrs. C.P. Howland, Letter to Alma Clarke, November 12, 1917. Box 1, Folder 2. Alma A. Clarke Papers, 1914-1946, Special Collections Department, Bryn Mawr College Library. Page 3 image AlmaClarkeFrench_BMC_0003r French WWI Scrapbook, Alma A. Clarke Papers, 1914-1946, Special Collections Department, Bryn Mawr College Library. Harold Morton Kramer, .With Seeing Eyes: The Unusual Story of an Observant Thinker at the Front (Lothrop, 1919), 10.
page 4 image AlmaClarkeFrench_BMC_0004ra French WWI Scrapbook, Alma A. Clark Papers. Bryn Mawr College Special Collections. Lee Meriwether, The War Diary of a Diplomat (Dodd, Mead, 1919), passim. Religion was a compelling force in the twentieth century; a time when five-hundred and sixty million Christians were located around the world, fourteen million in North America alone. When the Great War broke out, Christians looked towards religion for answers to explain the unexplainable. The unprecedented world war redefined the word “violence” and shattered any previously conceived images or ideas soldiers had of warfare. Some Christians believed this war to be the sign of a coming of the Apocalypse due to the number of dead soldiers (on both sides) and the duration of the bloodshed, a belief almost solidified by the notion that tens of millions of innocent Christian soldiers had to kill each other. Turning towards religion, the families of the deceased saw the soldiers’ death as a biblical sacrifice and/or martyrdom. This idea came to life in illustrations that were publicized throughout the Great War. An example can be seen on the next page. 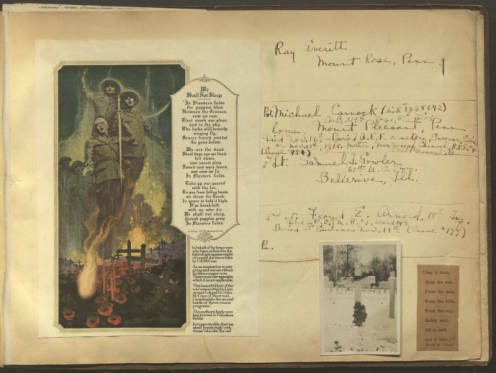 In the advertisement , soldiers are looking up at an apparition of Jesus Christ .Alma A. Clarke inserted a great deal of religious imagery into her scrapbook. Clarke may have shared similar feelings (like other Christians) about the war, which led her to attend numerous religious celebrations in France. Although we do not know the true reason why Clarke placed certain religious images in the scrapbook and left out others, we do know that they had a great impact on her. American men and women typically entered the fight for personal reasons, to answer the call to arms, or for a sense of redemption but this war slowly evolved into a religious crusade. The Committee of Public Information launched the largest propaganda campaign in the United States. Religious figures were slowly incorporated into the organization’s ads due to the large volume of Christians living in America. Angels were used to portray guardians who protected soldiers and as images of the fore coming Apocalypse. The image on the previous page showcases this trend. Clarke probably included this picture in her book, because it was from the Red Cross Magazine . Since Alama A. Clarke was a Red Cross nurse, information from these magazines can be found throughout her scarp book. One of the most famous Christian figures, Our Lady of Fatima, was known to appear to appear to three children circa this time, so her involvement in posters is easily explained. Jesus Chris was portrayed on both the Allied and Central Power sides of the war, as he was a heroic leader who sacrificed himself for his people (country). Not all religious peoples viewed the war as “just.” The Vatican was a large proponent of Christian anti-war activism. Other religious leaders spoke out against the violence of war and the Great War itself. Churches acted as tools and targets for and against the war effort. Soldiers who were assigned to be trench dwellers (also known as foxhole dwellers) turned away from religion and found solace in atheism. One of the more powerful organizations that utilized religious propaganda was The Red Cross. The Red Cross was widely known for sending female nurses off into battle to help the wounded soldiers. In order to romanticize and spiritualize this widely known process, the organization decided to depict these nurses as angels or the Virgin Mary, Mother of God. This was not an uncommon technique. 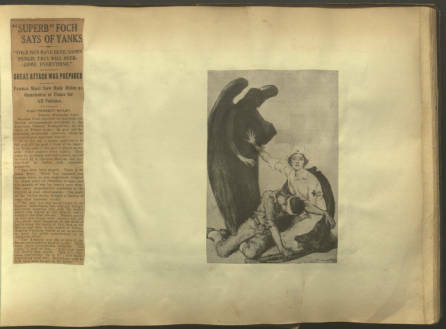 In fact, in 1915, the Belgian Red Cross portrayed a nurse with angel wings helping a wounded soldier in one of its advertisements. Apparitions of the Blessed Mother were believed to be occurring around the world (one of the more well known apparitions was at Lourdes) at this time, and because Mary is also found in the book of Revelation to be appearing before the apocalypse, her inclusion was justified. Alma A. Clarke chose to use this image as the front piece of her scrapbook. This image was also taken from a Red Cross Magazine . Being a Red Cross nurse, the image may have affected Alma in a personal and spiritual way. So much so that she chose it to represent her experience with the Great War. As time went on, the Great War turned into a spiritual warfare. Soldiers wrote in letters, poems, memoirs, and diaries about God’s role in the atrocities of war while also spending time reflecting on the meaning of death and the afterlife. War made the average American man in uniform feel alone and turn towards religion, along spiritual beliefs to be tested, lived, and animated. Religion also “romanticized” war and enabled soldiers to ignore and cope with all the bloodshed. The Great War became a battle between good and evil; the Allied soldiers were depicted as good Christians who were fulfilling God’s will while on the opposing side, the Central Powers were seen as the minions of Satan who needed to be stopped. Suffering was felt on both sides of the war both on and off the battlefield. Poetry was a common way for writers to express this suffering that was prevalent during this time period. One of the more famous poems that target a specific group is “The Prayer of the Women” by Sara Teasdale. The poem conveys the hurt and sorrow the mothers, sisters, and wives of those shipped off to fight in the Great War. Also, the women in the poem ask God for strength during these tough times. Soldiers were not that only ones who suffered. Even though people on the homefront were far away from the trenches and horrors present in Europe, this group too suffered just as much as those in the line of fire. Out of sight did not necessarily mean out of mind. Many people turned towards religion for comfort. People could not comprehend or cope with the violence seen in the Great War. Religion was seen as the shoulder for women on the home front to cry on and the support soldier’s on the battlefield needed. Alama A. Clarke may have decided to include this page in her scrapbook, because it illustrates the suffering women felt during the Great War. Throughout the scrapbook, Clarke lists the names of soldiers (that she may have known) and how they died in the war. 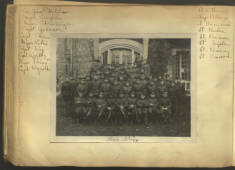 The deaths of these soldiers may have affected Clarke in such a way that she felt the need to include this image in her scrapbook. Jenkins, Philip. The Great and Holy War: How World War I Became a Religious Crusade. HarperOne, 2014. McFadden, Paul. "American Propaganda and the First World War: Megaphone or Gagging Order?" eSharp, no. 19 (2012). Accessed November 5, 2014. 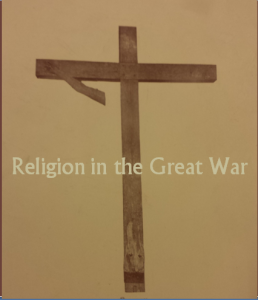 Ebel, Jonathan H. Faith in the Fight: Religion and the American Soldier in the Great War. Princeton, NJ: Princeton UP, 2010. Print. At the onset of the Great War, a hospital was opened to the military in a suburb of Paris called Neuilly-Sur-Seine. This hospital was “the Ambulance de l’Hôpital Américain de Paris” or a hospital run by and for Americans living in Paris. 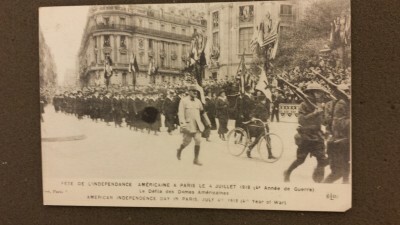 Upon the request for aid at the hospital, American volunteers went to Europe to aid the war effort despite the lack of American military involvement. The American Red Cross, among other American war organizations, began work in Europe at this time. The Red Cross, however, chose to maintain “limited medical missions” until the United States held a more prominent role in the war (Schneider 55). Prior to American entrance into the war, and after, the Red Cross offered aid to the European populous. The Red Cross established a welfare program, a French Refugee Bureau and a French Children’s Bureau all for the benefit of the French people. American volunteers, such as Alma A. Clarke, “went with the purpose…of expressing in relief work the sympathy of the American people for the civilian population of the Allies” (Dock 756). When the United States entered the war militarily, American Red Cross involvement increased throughout Europe. Alma. A Clarke worked as an auxiliary nurse at The American Red Cross Military Hospital No. 1 (pictured at left) in Neuilly-sur-Seine from November 1918 to January 1919. With an American presence in the war, the Red Cross became able to branch into other war efforts. The Red Cross was successful in this endeavor due to “[the American Red Cross’] table of organization [which] rivaled or exceeded in complexity and diversity those of the military” (Schneider 54). This organization was due largely to the Red Cross’ monopoly on supplies and the Red Cross’ shipping capacity. The Red Cross was the main source of medical supplies during the war. The Red Cross also controlled the shipping policies of the supplies. With this monopoly and superior organization, the Red Cross was able to infiltrate other war efforts “despite their resentments and apprehensions”. It became clear that “if [the war efforts] wanted supplies…they had to ‘cooperate’…so the American Ambulance at Neuilly” began to cooperate with the American Red Cross (Schneider 56) leading to an American Red Cross presence at the hospital. It was in this cooperative effort that the American Ambulance at Neuilly became the American Red Cross Hospital No. 1 and the hub of American Red Cross involvement in Paris. This presence allowed for more effective involvement American volunteers: auxiliary nurses such as Alma A. Clarke (pictured at right). Upon entering the service of the American Red Cross, Alma and her compatriots surrendered their previous lifestyles and engaged in a highly structured and strictly governed world of rules and regulations. These rules dictated when to wake up, how to dress, when to eat, and how to conduct oneself while engaging with patients and medical professionals. In an account of life at a Red Cross hospital, one nurse writes, ”This morning I went to the hospital and worked with the Red Cross people until half-past one. Then luncheon. Then a lecture from two till five” (War Letters). This brief description is indicative of the fast-paced, busy environment in which these nurses worked. Through these letters, it becomes clear how important the rules were to maintaining a productive workspace. The nurses were expected to remain in their wards—except to go to lunch, go to a Red Cross training session, or rest—and do their work in a silent and efficient manner. The nurses’ constant presence, however, endeared them to their patients (as seen in the picture at left). Their twelve-hour workdays allowed for strong nurse-patient relationships. Due to these relationships, Red Cross nurses became a symbol of hope for the wounded, as is reflected in Clarke’s scrapbook. Despite the harsh conditions of war, the auxiliary nurses maintained rewarding relationships with their patients. 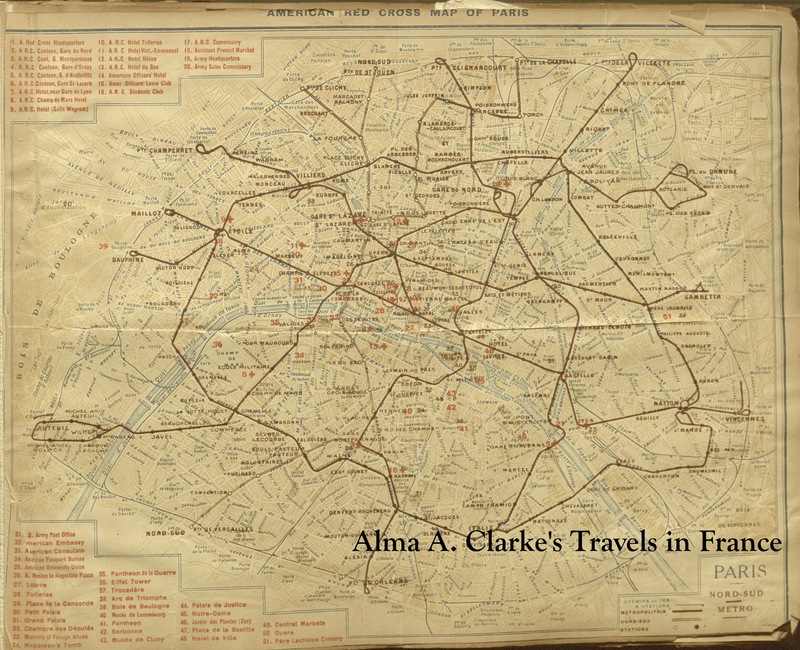 In a letter to her brother, Alma A. Clarke states, “I do hate to go home till I have done all that I can in France” (Moravec). This snippet indicates just how invested Clarke and her fellow nurses were in the war effort and the care of the wounded. 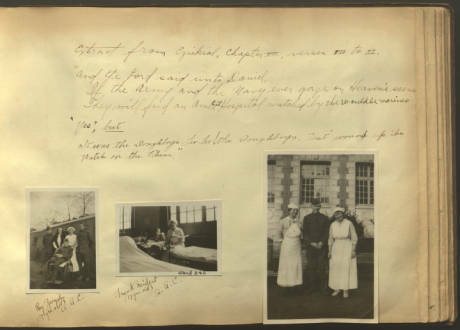 In such a short time, Clarke was able to connect with many of the patients in her ward and compile a book of mementos from her time in France with the wounded warriors of the Great War. Throughout the scrapbook, the role of the auxiliary nurse at Neuilly-sur-Seine becomes very clear. These nurses acted, not only as nurse, but as friend and sister; confidant and mother. This is made clear through a letter written by a soldier who was released from the hospital and kept in contact with Clarke (pictured at left). In a war where these soldiers were confronted by grief and isolation, the auxiliary nurses provided a constant presence and care that remains alive in the pages of the scrapbook of one nurse: Alma A. Clarke. Cover - image AlmaClarke_BMC_004r English WWI Scrapbook, Alma A. Clarke Papers, 1914-1946, Special Collections Department, Bryn Mawr College Library. Page 1 image AlmaClarke_BMC_004v English WWI Scrapbook, Alma A. Clarke Papers, 1914-1946, Special Collections Department, Bryn Mawr College Library. Page 5 image AlmaClarke_BMC_031v English WWI Scrapbook, Alma A. Clarke Papers, 1914-1946, Special Collections Department, Bryn Mawr College Library. Dock, Lavinia L. History of American Red Cross Nursing. New York: The Macmillan Company, 1992. Schneider, Dorothy and Carl J. Into the Breach: American Women Overseas in World War I. New York: The Penguin Group, 1991. Van Vorst, Marie. War Letters of an American Woman. Online Archive. Poetry from The Great War has had a lasting impression on literature around the world that continues today. No one really understands why so much war poetry was written during the war itself about the war but there is thought to be over 3 million poems written in Germany alone during the first six months, 2,225 English poets, over half of whom were civilians. Although there was more written academically about The Second World War, the Great War produced much more literature, especially verse. This could be due to a few different factors including that warfare was finally accepted as a literature subject and not just covered briefly in newspapers. Chauvinism was not necessarily more prevalent before and during The Great War but because war was an accepted topic for literature, it seemed to be more prevalent to readers. Compared to the Second World War, the literacy and artistic styles may have become outdated because The Great War literature illustrated a vision of hell and the soldiers of the Second World War experienced that hell, leaving not much to write about that would be different from before. 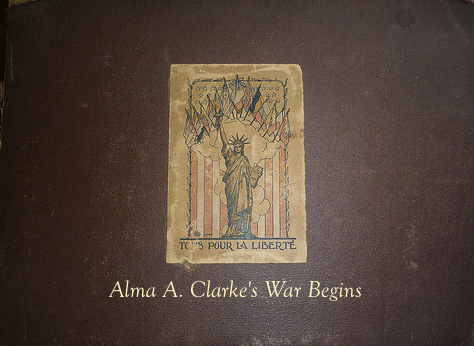 In this scrapbook there is poetry that was published from the time that resonated with soldiers as well as Clarke and poetry from the soldiers whom Alma A Clarke tended to in American Military Hospital no.1. Private Clarence E. Meyers, a member of the 74th company 6th regiment U.S.M.C. This company was placed in the 1st battalion and fought in the Battle of Belleau Wood. They fought day and night with little food or water and virtually no sleep against some of the best German Divisions using strategically placed machine guns. Despite injury, fatigue and hunger these men held the line as ordered. In the poem, Clarence E. Meyers writes about bursting shells, gas bombs, trench life and never abandoning duty which can be read as a description of the Battle of Belleau Wood. Supposedly, as a marker of grudging respect, the Germans began to refer to such Marines as Teufelhünden or "Devil Dogs". While there is no actual historical evidence for the precise origins of the term, the nickname is said to stem from the response of the Germans to their attackers. The Marines who were forced to climb up a hill on all fours due to the terrain, also sweated profusely, foamed at the mouth due to the excessive heat and had bloodshot eyes. The Germans are said to have described these attackers as "dogs from hell." Historians now dispute that the phrasing is one that would not have been in common usage at the time. German Military Historian Jürgen Rohwer has argued that soldiers would have been far more likely to refer to the Marines simply as “devils”. Still The Marines have adopted the label as a badge of honor and it continues to be used today. Raymond Gauger along with twenty-three other men from the University of Illinois, sixteen of whom were in the same unit (Section Sanitaire (etas) Unis) traveled to France during WWI to join the American Field Service in 1917. These men stayed in touch with their families through letters, while simultaneously writing poetry about their experiences. The included poem received Honorable Mention in the New York Herald Literary Contest while Gauger was still in active duty over in France. The poem was supposed to appear in a book whose profits would have benefited the wives and mothers of the men fighting abroad. According to an article in The Daily Illini Gauger’s inspiration for the poem is about the death of a French woman whom with Gauger spent his week of permission in March of 1918. Unfortunately, the Germans killed the woman and her secretary in a Catholic Church in Paris on Good Friday, leaving another blemish on Gauger’s already bleak war experience. Sergt.Wm.E.Shiflet was part of the First Infantry Division, which was known as the First Expeditionary Division during the Great War. Constituted in May 1917 and officially organized June 8, 1917 in New York, New York, the division did not engage in battle until October 3 that same year, where two days later, they suffered the first American causality of the Great War. When the Germans were within forty miles of Paris, the First Infantry moved into the town of Cantigny to aid the French army, resulting in the first American casuality. The Infantry was also involved in the Soissons victory, the Battle of St. Mihiel, and the Meuse-Argonne battles in which the division lost a total of over 7,600 men. By the end of the war they had suffered 22,668 casualties plus countless injuries. 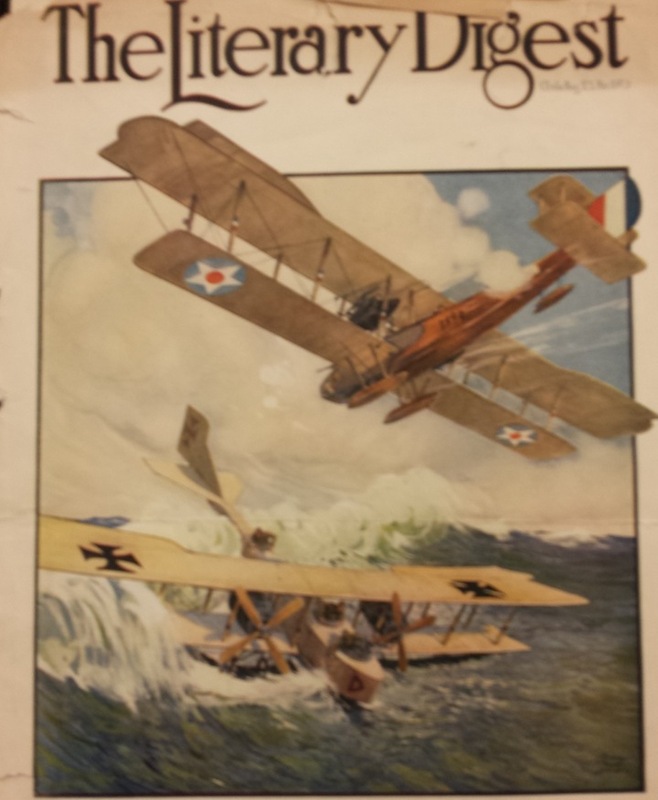 Cover – Literary Digest Cover. Box 1, Folder 2. 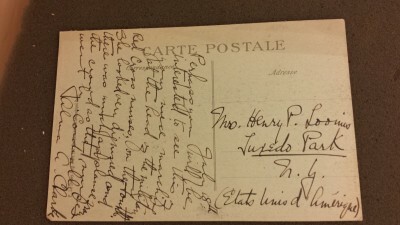 Alma A. Clarke Papers, 1914-1946, Special Collections Department, Bryn Mawr College Library. Page 3 Harvey, A. D. "First World War Literature." History Today 1 Nov. 1993. Print. Page 4 image AlmaClarke_BMC_023v English WWI Scrapbook, Alma A. Clarke Papers, 1914-1946, Special Collections Department, Bryn Mawr College Library. Page 5 "1st Battalion, 6th Marine Regiment". Marines The official Website of the United States Marine Corps. http://www.6thmarines.marines.mil/Units/1stBattalion/History.aspx Clark, George B. "Belleau Wood." Devil Dogs: Fighting Marines of World War I. Novato, CA: Presidio, 1999. Print. Simmons, Edwin H., and Joseph H. Alexander. "Belleau Wood." Through the Wheat: The U.S. Marines in World War I. Annapolis, Md. : Naval Institute, 2011. Print. Simmons, Edwin H., and Joseph H. Alexander. "Belleau Wood." Through the Wheat: The U.S. Marines in World War I. Annapolis, Md. : Naval Institute, 2008. 100-125;269. Print. Page 6 image AlmaClarke_BMC_14r English WWI Scrapbook, Alma A. Clarke Papers, 1914-1946, Special Collections Department, Bryn Mawr College Library. Page 8 image AlmaClarke_BMC_01r English WWI Scrapbook, Alma A. Clarke Papers, 1914-1946, Special Collections Department, Bryn Mawr College Library. Page 9 "Society of the 1st Infantry Division." Society of the 1st Infantry Division: History. 1 Jan. 2007. Web. 17 Nov. 2014. . The Allies' Flower Song. 1917. By Edith M. Gibbs.